Here’s an amazingly obscure piece of Who memorabilia – a fruit machine that once belonged to John Entwistle. 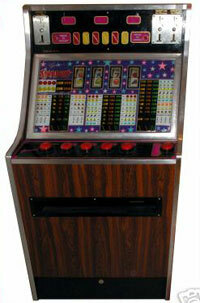 Or rather – a fruit machine that’s claimed to have once belonged to the now-deceased Who bassist. I’m pretty sure it did – evidence of ownership comes from a previous auction catalogue featuring the machine. This early 70s fruit machine, which is currently up for grabs on eBay, is a Gemini four reel "Stardust" with a £40 Jackpot and was previously to be found at Entwistle’s "Quarwood" home. I’d suggest inviting your mates round with their £1 coins to make your cash back – but they didn’t have £1 coins back then – you might need some old 10p pieces to use it! Anyway, if you need this for your house, it’s yours for a starting bid of £750.